A cracked tooth is nothing to take lightly. Dr. Jon Jenson takes a cracked tooth seriously, and he even outlines five specific kinds of cracked teeth. Vertical Root Fracture. We’ll start with one of the most extreme (and least common) kinds of cracks. A vertical root fracture is where the tooth breaks up the middle, starting at the root and going out toward the surface of the tooth. Sometimes the tooth can be saved with endodontic surgery, but this kind of fracture often requires extraction. Luckily, these make up less than 5% of fractures in Utah County. Fractured Cusp. In layman’s terms, the “cusp” of a tooth is basically a bump that sticks out and helps you chew your food. Your bicuspids have two cusps (see what they did there?). Your molars usually have four or five cusps. A fractured cusp means that a cusp weakens and either breaks off or needs to be removed by your Orem dentist. Depending on the extent of the break, the tooth’s pulp may or may not be affected. Sometimes a root canal is needed, and in either case the tooth is usually restored with a dental crown. Craze Lines. These are very common, almost microscopic cracks in the enamel of the teeth. The superficial cracks usually don’t go any farther than the enamel and do not affect the health of the teeth. Craze lines don’t usually affect oral health or require treatment, although it’s a good idea to schedule twice-yearly dental appointments with your local Provo dentist to have them watched. Cracked Tooth. A cracked tooth is usually caused by some kind of trauma or tooth grinding. It involves a crack that starts at the chewing surface of the teeth and extends into the tooth toward the root. The tooth pulp is often damaged, and a root canal is usually needed. After the root canal, a full dental crown is placed to protect the tooth from further damage. Split Tooth. These are most often caused by ignoring a cracked tooth. 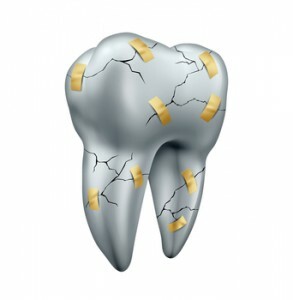 If a cracked tooth is not treated, the crack can grow and spread until the tooth actually splits. These can be extremely painful, and the tooth cannot be saved completely intact. Depending on where and how extreme the split is, a portion of the tooth can often be saved. As you can see, there is more than one way to split a tooth! If you have a cracked, split, fractured, or otherwise damaged tooth and live near the Utah County area, please come in and see us as soon as possible. The earlier we can treat your problem, the better the outcome will be. Call us at 801-734-9087 to schedule an appointment with Dr. Jon Jenson.